This week’s episode finally saw the return of the amazing Rowena (Ruth Connell), looking both stunning and imposing as she attempts to persuade witch friends to join her terrifying…MEGA-COVEN. Sorry, Rowena. You’re going to have to work harder on the name if you want to be taken seriously! As the witches refuse to join her they meet a fiery end but not before they tell her that Crowley is alive and kicking. As Crowley’s forces close in on Rowena she escapes by wrecking a restaurant, probably not the best way to remain under the radar. Back in the bunker, Dean seems to be consumed by thoughts of The Darkness and his encounter with Amara while he, Sam and Cas try to figure out what happened to the child when she escaped Jenna’s grandmother’s house. 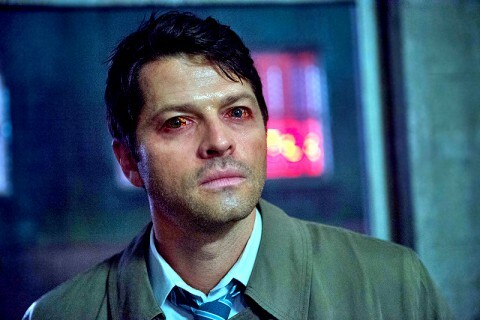 Cas is bound as he attempts to fight the spell causing him pain and violent urges and the boys reach out to Crowley to ask him if he has a lead on Rowena, the only person who can reverse the spell. With Crowley not contactable they turn to other means, finding a news article about the destruction of Café Elta (a sweet inclusion – Elta is director Jensen Ackles’ wife, Danneel’s, birth name) and head to the town to see what leads they can find. When the Winchesters interrogate one of Rowena’s potential recruits, we once again see them working together at questioning her and, embodied by a particularly impressive move of Dean throwing the witch’s purse behind his back for Sam to flawlessly catch, it seems that we truly do have the togetherness of the brothers we have been looking for. The terrified witch reluctantly helps them to avoid being handed over to Crowley. Having found and captured Rowena they discover she has the codex but not the Book of The Damned and Rowena realizes she has the upper hand in their arrangement. With the attack dog spell taking an even stronger hold on Cas he breaks free and the Winchesters take Rowena with them to find him. She takes the opportunity to stir up trouble between the boys and tells Dean of Sam’s agreement with her to kill Crowley if she removed the Mark. Dean berates Sam for keeping secrets and while there still seems to be some working out of issues between the boys, the fact that Dean can tell Sam that he’s pissed off about keeping things under wraps is a vast improvement on their previous disagreements. 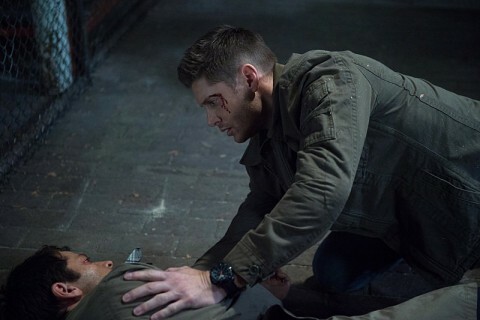 Cas has his sights set on a young victim who he chases into an abandoned building. Dean reaches her just in time but suffers a brutal beating at the hands of a worsening Cas. With a gun to her head Rowena reverses the spell before escaping and Cas is left feeling guilty for how he injured Dean. Of course, Dean admits he feels like he had it coming, suggesting his guilt for the involvement in the release of The Darkness will be an ongoing theme. One of my favorite scenes of the episode was the meeting between an angel and a demon at a bar. These low level members of Heaven and Hell lament about the disorganization of their respective homes with a nice injection of subtle comedy. Reminiscent of the season 5 scene with Zachariah crying on the shoulder of a fellow down-on-his-luck businessman, it is a good representation of how caught up in their own battles the leaders are. They are so intent on winning their own war that they have no concept of the effect it is having on the people who do the grunt work; possibly an interesting commentary on how the world is running these days? 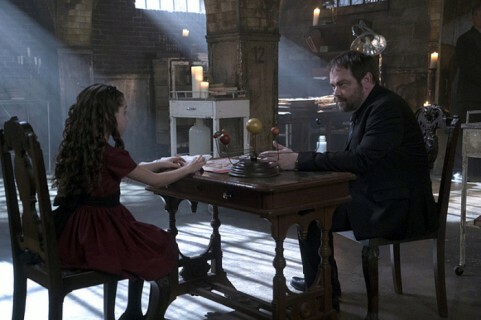 Crowley has taken on the mantle of benefactor/guardian to the young Amara, employing a Nanny to help her in her studies, currently encompassing Hitler’s Nuremburg speeches! Crowley recognizes the potential power of the child and feels a need to mold her to his will. She feels a connection to Crowley because she sees him as someone who could protect her from God, the reason for her incarceration. Crowley sees her as an ally but she questions his desire to have a world filled with evil. He admits that would offer less of a challenge but it is apparent that he is agreeing with her to make his life easier. In an interestingly shot scene young Amara has a conversation with her older self’s reflection in the mirror as she tries to understand the things God has done to the earth since her capture. Young Amara seems upset by images of destruction and her older version tells her God did it for his own ego. She hints at a purpose that young Amara must not lose sight of. When Crowley suggests God’s Big Bang was a Big Bust he tells the child he assumes she would have done things differently. Her response of “I sure will,” definitely lends credence to the assumption that she is planning something of a purge. The fact that Crowley is somewhat wary of her intentions, Mark Sheppard playing the fear perfectly, definitely makes her an interesting character. Given his fear of her it is possibly ill-advised when he tells the new Nanny to withhold her food. There’s a beautiful dichotomy about Amara. While she’s sucking the soul of poor hapless Nanny she’s questioning genocide. It seems she is a bridge between Heaven and Hell and to me it is reminiscent of Sam’s split soul in season 6. While we had the pure, innocent Sam and the driven, ruthless Soulless Sam, they weren’t complete until they were together. In many ways it represents the struggle Sam and Dean face on a daily basis; the desire to do the right thing battling against the “evils” that often need to be done to get there. Jensen Ackles’ fifth directorial appearance was another strong one, his tendency to push in close gives an intimate feel to the scenes and it’s obvious the actors respond well to his direction. Overall, I thoroughly enjoyed the episode; it moved all aspects of the story-arc along well while still leaving many questions to be answered. The Winchesters definitely have some ways to go before they are 100% on the same page but the desire to mend their rocky relationship is apparent in both and I have a positive feel for their future. What did you all think? Next up is the much anticipated episode, Baby! Can’t wait for that one!